Does Google's floating datacentre plan hold water? 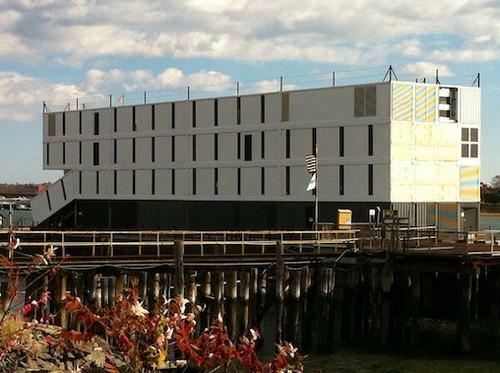 These shipping containers piled on top of a barge in Portland, Maine, could be a Google floating data center, although the Internet company won't say. A similar barge is docked in San Francisco Bay. With speculation swirling that two mysterious barges on either side of the US. are evidence Google's working on floating datacentres, analysts say the company would have a lot of obstacles to overcome for that idea to become a reality. "It's not that far fetched," said David Cappuccio, a vice-president and chief of research at Gartner Inc. "You have to be somebody of Google's size to even consider this." The two barges -- one docked in San Francisco Bay and the other docked in the harbor in Portland, Me. -- produced a barrage of questions and rumors in those communities. Then people realized the two barges are owned by the same company and have very similar names, prompting even more speculation. The barges each carry a large, structure seemingly comprised of shipping containers. They're about 40 feet wide and 70 to 80 feet long. It's widely thought that Google owns the structures, which could be carrying floating datacentres, Google Glass stores or Apple-like Google retail operations. Google has not responded to multiple requests for information on the barges. Fueling the speculation, though, is the level of secrecy around them. Portland officials say they don't know what's on the barge docked in the harbor and the local Coast Guard station reported that only the captain there knows what's onboard. A worker at The Cianbro Co., the construction company contracted to work on the barge in Maine, told a reporter taking photos of the barge to leave the property. Today, Cianbro CEO Pete Vigue said that there is little he can say about the project. "It is docked at our wharf," said Vigue. "I'm not allowed to make any comments on our involvement or what we're doing or what is happening at our facility. There is a very strict non-disclosure agreement." He did add that he thinks this will be positive for the state of Maine. "I think it's very positive and we'll leave it at that," he said. The barge carrying the mysterious structure from New London, Connecticut, to Maine, was brought into the Portland harbor by the tugboat Rowan W. McAllister earlier this month. A person answering the phone at Portland Tugboat said no one at the firm was told what's inside the structure or what it will be used for. According to Google's patent, which was filed in 2007 and issued in 2009, the floating data center would be built with modular units such as standard shipping containers that could be hauled on ships or trucks and then lifted by crane onto the data center platform. The data center servers would be mounted in rack arrays, meaning they can be easily traded out just by swapping the containers when newer technology is available or if hardware becomes corroded by the harsh salt water environment. The plan to use modular shipping containers stacked together matches the look of the structures on the two barges. Since the datacentre is on a floating platform, it could be easily moved to an area in need, such as one struck by natural disaster that is putting a heavy load on the local infrastructure. The patent also noted that a ship or barge, which would carry one or multiple data centers, could anchor in an area offshore where wave or tidal motion is strong enough to power onboard electrical generators. The floating data center, according to the patent, would be fueled by motion-powered, floating machines arranged in a grid and wired together. The machines, such as those built by Pelamis Wave Power Ltd in Edinburgh, Scotland, capture the natural motion of the waves, tides and current and convert it into electricity or pumping power for the data center's cooling pumps. Pelamis, which is specifically mentioned in Google's patent, manufactures an ocean wave energy converter that generally operates in waters deeper than 164 feet about one to six miles offshore. The wave power machines, which are about 11 feet in diameter and about 492 feet long, can be linked end-to-end to form a farm of machines. The farm could be held in place by mooring lines attached to anchors. They also could float on top of the water or be submerged, protecting them from strong storms or from being damaged by passing ships. Google noted in its patent that each machine can generate approximately 750 kilowatts of power, while an array or farm of machines can produce more than 2.25 megawatts. About 40 machines spread over a square kilometer could produce approximately 30 megawatts of power, Google reported. Google's patent also noted that wind turbines could be used to supplement energy production and batteries onboard the floating platform or ship could store any excess energy produced. The system also would use seawater-to-freshwater converters. The cold water would then be used to cool the data centers, which can produce great amounts of heat. Cappuccio noted that only a very large company, such as Google or Facebook, would need a data center large enough to require upwards of 30 megawatts of power. "There are a lot of issues here," he added. "If they were to do this, they'd have to think about fishing areas and international shipping lanes. And what about telecom? They're not going to use satellites to support the amount of workload they're talking about. They'd have to lay underwater telecom cable and that doesn't make them mobile." Cappuccio, though, said Google is known for some out-of-the-box thinking and could be working on validating its idea. Christian Perry, an analyst with Technology Business Research, said there could be serious benefits from offshore data centers. "As cloud deployments grow in size and scope, the need for alternative data center infrastructures becomes more critical," he explained. "The more dense the data center server environments become, the bigger the challenges with power and cooling. Denser server architectures output more heat, which in turn demands more cooling. We'll see this increasingly with hyper-scale deployments geared for the cloud." And Zeus Kerravala, an analyst with ZK Research, said if Google does test floating datacentres with some success, it would be a big innovation for the industry. "They'd have cheap space and unlimited power if it's really powered off of waves," he said. "Google likes to throw stuff at the wall and see what sticks."